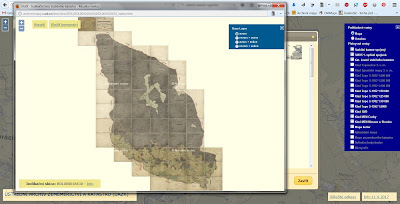 I promised to write a post about Stabile cadaster maps and mapping so here it is. It provides information about stabile cadaster - what it was, why it was done, when and so on - as well as information about maps - where to find them, what types of maps are available and so on. So, let's take a look on it! Stabile cadaster (stabilní katastr in Czech) was a set of information about all land types in Hapsburg monarchy. Mapping of stabile cadaster was done in first half of 19th century during the reign of Franz I. and the reason to do such mapping was quite simple - to have enough information to assess real estate duties. Bohemia was mapped during years 1826-1843, Moravia during years 1824-1836. Cadastral maps with scale 1:2880 were created during this mapping which provide basis to Czech cadaster till today. There are two different types of them available - imperial maps and indicator sketches. Once you get to the website you see the screen as above. Write a name of the village or town you are looking for to the searching field in the top left corner and then press Hledat (don't press Enter, it doesn't work in some of the browsers). The search results will list all the villages/town with the name you searched for. I chose Desná in Jablonec nad Nisou district for my purposes. When you click on the name of the village, the map will zoom there. Once you are sure you have the correct village/town (use information about district - okr. in Czech), click on the map itself. You will receive a list of maps available for that area - stable cadaster maps are usually the first ones in the list. When you click on the picture of the skica, new window will appear with the map. Thanks for the very informative post!! In my ancestor's case, he seems to have owned multiple plots of land around his village (Ceska Trebova), but also there are plots in the names of his wife and several children. Is this usual to have women and children owning land at this time (1839)? This was a farmer/weaver, not the aristocracy. Thanks for any insights you can give me. Hi Diana, are you sure all of those plots belonged to one family? It could happen that some plots are owned by wife or children when they inherited it from some other family member. I love the Czech map resources. I do have one question. My Svec family line is from Radnice (Rokycany) and when looking at the map of the city, there are both red and black numbers for the same properties. I have been to Radnice and the numbers on the map don't seem to match the current house numbers. So how do I identify the buildings on the maps that are found on the birth/marriage/death records? Thank you for your time and excellent blog. Hi Mike, some towns and villages use two types of numbering today - descriptive number and orientation numbers. You need to have descriptive numbers (číslo popisné) to get the correct house. Could you give me an example of house number in Radnice where your ancestors were born? Excellent directions on how to do this. I was able to locate many ancestor's villages and find quite a few named on the maps. Thank you. It's possible to order the maps from National Archives - however I have to say I'm not sure if they are able to send those maps online. Could you give me information about the map/village you want and I'll try to ask them? I would be interested in the 1842 map of Gebirgsneudorf (Nova ves Horach). I would not need it sent online if I could purchase a copy and have it sent to the United States. Congratulations on your new child. I am new to genealogy and your website has been a gold mine of information. Thank you! Thanx a lot for this post. I'm new at genealogy. I'm half Czech and Mom ask me to search all my anchestors as she got some names. This map is incredible, so are you !! Thanks a lot for this post. I'm new at genealogy from this area. I'm a small % Czech on my paternal side would like to search ancestors. Thank you!